Teamup Calendar allows you to upload or insert images directly into events. You can display them as inline images, in the List or Agenda view when the Details box is checked, as shown below. 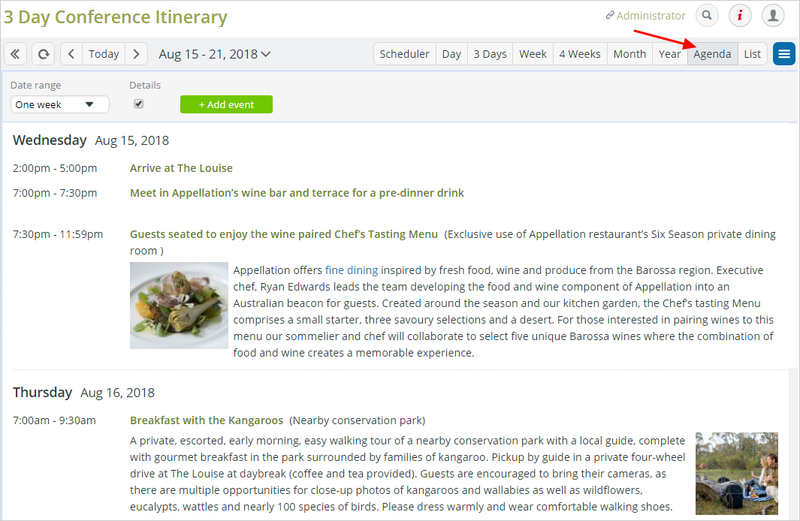 This feature makes it easy to create and share program itineraries, event brochures, party flyers, invitations, conference agendas, presentation info, and more using your Teamup Calendar. Any updates to the event or calendar are instantly accessible to all users. To insert images into an event, click the Description field in the event editor. This opens the full toolbar; then you can choose the best option for inserting your image. If the image you want to display in your event is accessible online with a URL, click the image icon in the tool bar. You will have the option to paste the image URL and adjust the image size. This option is available to Teamup Calendar users on any pricing plan. If the image you want to use is stored in your Dropbox account, click the Dropbox icon. You will be prompted to log in to Dropbox. If you are already logged on, choose your image or file from your Dropbox folder. This option is available to all Teamup Calendar users on any pricing plan. If you would like to upload an image to Teamup from your local computer or from other online storage services, click the upload icon and choose the files to upload. You can choose to upload a file from an online service storage service (such as Flickr, Google Drive, Instagram, and others) or from your computer. This option is available to Teamup Calendar users on the Premium pricing plan. Learn more about uploading images and files to Teamup. Having images displayed in event details is a great way to create beautiful event flyers right from your calendar. Once you have created such a “virtual flyer,” you can share the event as an independent web page. Then share the page link anyway you want, through email, messaging, or social media.